Mackey Hedges is a real cowboy. Mac, as he is know to friends, has spent six decades working on ranches, punchin’, branding, roping, and doctoring cows. As Mac tells it, he may not be the Last Buckaroo, but cowboy-ing has changed substantially during his life time. Mac has worked on over forty different ranches in the West. He has some great stories to tell. Mac has a special insight into what it is like to work on a spread. He shares what it was like out on the range. In the Spring of 1990, Mac had a terrible wreck. He tells us exactly what happened and by the way he describes it, the memory is still vivid in his mind. Told by doctors he would have to change profession and faced with the prospect of never getting on a horse again, Mac turned to writing. He wanted to make sure his grandkids knew about his life. The result was The Last Buckaroo. Told through the voice of a seasoned cowboy as a novel, Mac describes his story of the West. 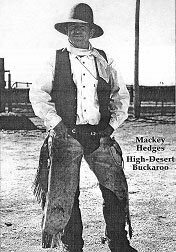 Helped by Cowboy Poet Baxter Black and many others, Mac got the book published. The novel won many honors including the Working Cowboy Award. Mac thanks, Robert Sigman of CowboysBooksandMusic.com for get the book back in print and available to the public again. Mac seems to prefers being a cowboy over writing. In 2010 he had another accident that laid him up and he wrote his second book, Shadow of the Wind. I guess the only way he’ll sit still long enough to pen a story is when he can’t be on a horse. Mac also goes into the importance of good horsemanship. We talk about professional trainer Matt Sheridan and the advantages natural horsemanship training provides the modern cowboy. The challenges and responsibilities a cowboy has with a string of horses are much more than the average rider will face. Mac is a good hand and has the cowboy ethic. 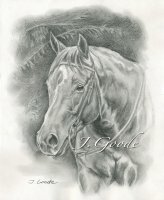 He truly embodies the the spirit of the American West and the Cowboy lifestyle.